Forgive me for a moment while I go into full-blown fanboy mode. I got to play Mario Kart 8 today. And it was glorious. If you don’t know, GameStops across America is doing a Mario Kart 8 Test Drive Weekend promotion thing, where you can go into GameStop and play a demo of Mario Kart 8. Because I’m far, far too excited for this game, I tossed my little brother in the car and drove like a madman to the nearest GameStop, ready to play latest iteration of Mario Kart. The reviews have recently come in, and they have been very positive, so my excitement was at an all time high. I expected to get a taste of the game, and cement my decision to pre-order. What I didn’t expect was just how damn extensive the demo was. I need new pants every time I see this. I started the demo, selected multiplayer because I guess I can let my little brother play with me, and went to the character selection screen. I expected four or five characters to choose from. NOPE. All thirty. All the Koopa Kids, all the babies, everyone. All thirty characters, ready to race. I couldn’t believe it. So, with eager hands, I went to my mainstay (Toad), and went to the car customization screen. So, before the demo even began, my heart was racing with excitement. This wasn’t some half-assed little demo meant to entice the kids, this was big part of the game, meant to convince me that my sixty dollars would be well spent. I picked an easy track (Mario Stadium) and let the game begin. What can I say here that hasn’t already been said in the reviews? Well, it bears repeating, regardless. This game is gorgeous. Like, unbelievably, eye-falling-out-of-head gorgeous. Many of the videos and screenshots simply don’t do the game justice. The Mushroom Kingdom has never looked this colorful, this bright, or this detailed. The characters all have facial animations. They trick off jumps with fluid motions. The cars have detailed treads on the tires. Everything just screams charm, delight, and joy. This game was a labor of love from the developers, and it shows. What of the racing itself? Great, as expected. 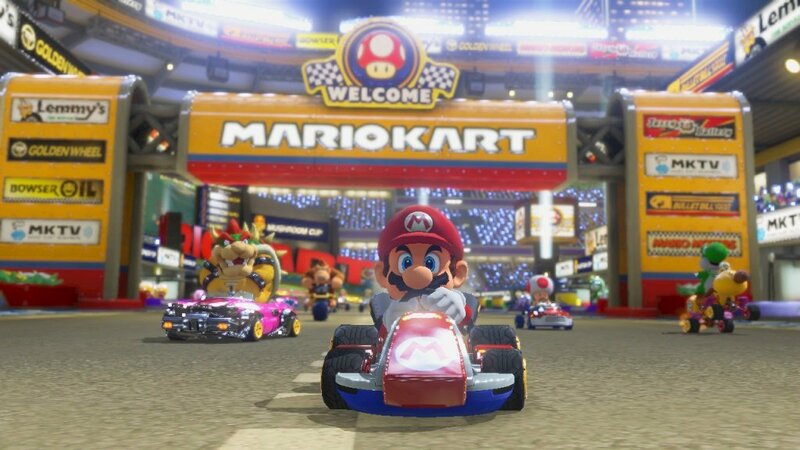 I missed out on Mario Kart 7, but the game does feel very different from Mario Kart Wii. The cars feel heavier, the drift feels sharper, and everything feels tighter. Drifting around corners is similar enough to past Mario Karts, but there is a noticeable difference that required me to adjust to. I don’t know if I quite got it right either. As Nintendo has made clear in their videos, they have taken great efforts to make sure cars and bikes are balanced. And, at first glance, they seem to be. The drifting in the cars felt about the same as I remember from past games, but the bikes’ drift has changed quite a bit. 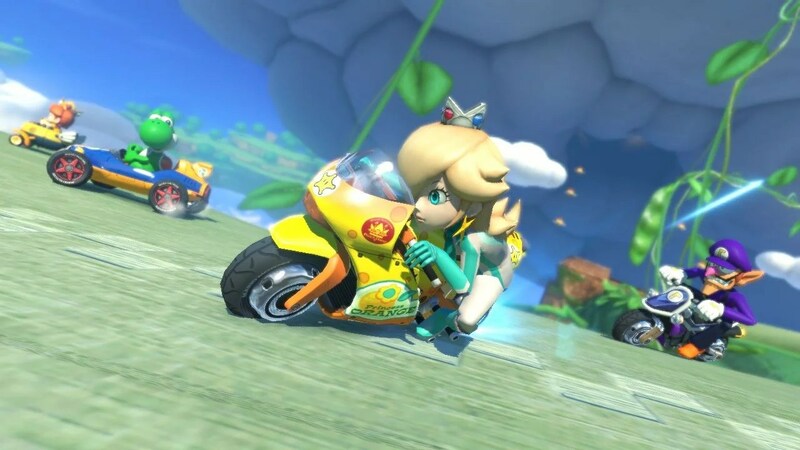 I managed to pick a bike that had the “inside drift,” where you pull tight to the corner instead of going more wide, and that has a much different feel than in Mario Kart Wii. Your bike starts almost straight when drifting, but when you go to turn, your bike cuts it very, very tight. It took some getting used to, and some corners will no doubt be made trickier because of it. Wheelies are gone, which is nice, though the bikes do pop up when you get some boosts. It seemed fair enough, though time will tell if bike or kart proves to be superior. The tracks on display were a good mix too. The most interesting ones to see were definitely the Electrodrone (which is what Nintendo thinks a nightclub looks like) and one that took place in the clouds. That one was my favorite, as it starts tranquil enough, driving over cloud roads, but one jump catapults you into a storm, with lightning striking boost pads on the track, turning them on and off. You have to dart around them, and react to the bolts for fear of getting slowed down. It was beautiful and thrilling to race on. One last thing to comment on. My brother and I played about ten races total (keeping the little kids away with our fierce glares) and in those races, I recall only one blue shell getting fired. It could’ve just been luck of the draw, but it seems as a whole that item use has been cut way down from past games. You actually have to use your race skills to keep ahead, something I welcome. It’s a better mix of chaos and skill from past games, and I really look forward to ramping the difficulty up. 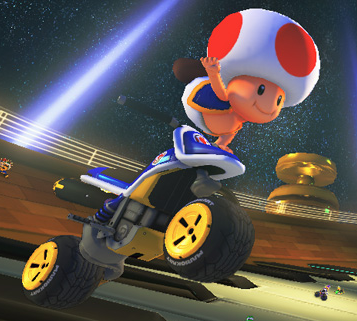 After this extensive demo, my hype for Mario Kart 8 couldn’t be higher. The gorgeous visuals, sharp racing, rebalancing, and just energy about the whole thing made for a game that simply demands to be seen. I want to go back and dig deeper into the game’s mechanics, but unfortunately, sooner or later, you have to let the children have their turn as well. These next few days can’t pass soon enough. See you on the race track.